An invigorating deep tissue full body massage treatment in which traditional acupressure and stretching techniques are used to focus on tensed and aching muscles and tendons. Our trained therapists will use hands, elbows and feet to apply pressure to the torso and limbs in a series of positions on a Thai floor mattress. Loose clothing is supplied to wear throughout the session and no oil is used. A soothing massage treatment that combines the acupressure techniques of traditional Thai therapies with the lighter Swedish style massage. A fully trained therapist will discuss your requirements and select essential oils to relax the muscles, soothe the emotions and condition the skin. Usually conducted on a massage couch this massage can be full body or focussed on the back, shoulders, or limbs. A traditional and therapeutic massage, reflexology can be both stimulating and relaxing. 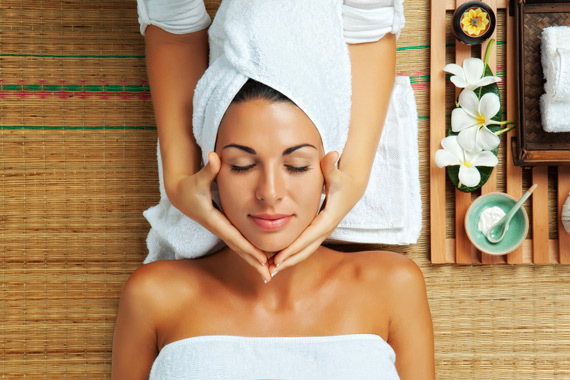 Our professional therapists will apply a firm and gentle acupressure massage to the feet and lower legs. According to traditional Thai teaching this stimulates the body’s natural energy and encourages healing and functioning of the organs. Soothing, stress relieving and uplifting, Thai head massage alleviates tension and stiffness in the neck and shoulders and invigorates the scalp and face. Our trained therapists will use both gentle and deep tissue acupressure techniques to release the build up of stress that result in ‘knots’ in the muscles of the neck, shoulders or back which can lead to headaches and migraines. Traditional Thai teaching suggests that such techniques can also stimulate the body’s natural energy and lead to a sense of calmness and wellbeing. Sports massage is a deep tissue therapy that combines elements of the Thai and Swedish systems and involves stretching, compression and toning. It is a technique that helps to alleviate the tensions that can build up in the muscles and tendons from the stress of physical activity. This can help prevent sprains and injuries occurring or minor aches developing to more serious conditions. Sports massage therapy is not just for sports people but can be beneficial for anyone with busy demanding lifestyles and occupations that cause stress to the physical posture through exertion or extended repetitive actions. This can be booked as an addition element to the traditional Thai massage or the Thai Oil Massage and consists of heated herbal compresses that are applied to alleviate specific muscle or ligament pains and stiffness, sooth back aches, joint pain or headaches and improve circulation. The special combination of Thai herbs have been used for centuries for their healing properties and relaxing scent to clean and heal the skin and calm the body and mind. This can be booked as an addition element to the traditional Thai massage or the Thai Oil Massage. The process is designed to exfoliate, cleanse and hydrate the skin using combinations of aromatic oils, herbs and minerals. These are then removed in our shower rooms leaving your skin toned, purified and softened.